Straight from the garden, the Rhubarb-Rosemary Daiquiri is a fun, fresh twist on the homemade Daiquiri. It is perfect for those spring and summer days when rhubarb is at its best. The cocktail also includes rosemary, which is a fantastic companion to the sweet-tart taste of rhubarb juice. To create this drink there are two things you need to do in advance: make the rosemary syrup and rhubarb juice. Both are very easy to do and require very little time in prep, though you will want to leave at least a few hours for things to cool and settle. The rosemary syrup recipe is quick and easy to make and it is a fantastic ingredient to keep on hand. Use it to sweeten lemonades or clear sodas or to add a hint of rosemary to other cocktails. Once you have these prepped, the cocktail is easy and it is an impressive drink to share at summer parties. Garnish with a lemon wheel, sprig of rosemary, or both. For the rhubarb juice, if you have a higher-end juicer you should be all set. Simply clean the stalks and juice away (some cheaper juicers will have a hard time with rhubarb). For those without a juicer, you will have to do it the old-fashioned way and the technique will give you almost the same results. Do note that rhubarb juice likes to separate after about 20-30 minutes. It's often best to let it settle then strain off the yellowish 'sludge' to get a clean, blush pink juice. The juice is a great way to use up your leftover rhubarb. It mixes with other fresh juices and is a great addition to lemonade as well. Place the cut rhubarb into a pot and cover with water. Bring to a boil over high heat, then cover and reduce the heat. Strain using a fine mesh strainer and press the rhubarb with the back of a spoon to get all of the juice. Allow to cool for about 4 hours in the refrigerator. If the rhubarb juice separates into a thick, yellowish layer and a pink juice, strain it again until you have only the juice. Use cheesecloth if necessary. How Strong Is the Rhubarb-Rosemary Daiquiri? Rum is the only liquor in this daiquiri, so it's a relatively mild cocktail. This adds to its appeal as a light, refreshing drink for spring and summer affairs. With an 80-proof rum, the drink weighs in with an alcohol content right around 17 percent ABV (34 proof). Once you get a taste for a rhubarb drink, you will want more. It's a unique taste and a ton of fun to experiment with. While you have that juice around, give one of these drinks a try. 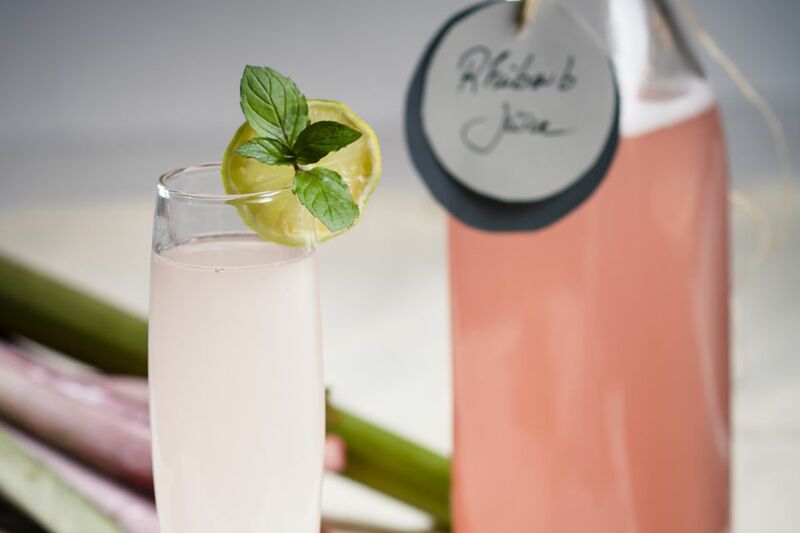 Rhubarb Collins - A garden-fresh twist on the popular Tom Collins, you will use your new rhubarb juice to create a syrup. Add a fantastic gin, a little lime, and some cardamom and rhubarb bitters and a magical new cocktail is formed. The Rhube - Don't use up all of your rhubarb supply for juice. Save a few stalks to make your own rhubarb soda for this enticing tequila-strawberry cocktail. Of course, if you want to skip the DIY ingredient, you can always turn to DRY Sparkling Rhubarb soda (it's fantastic).